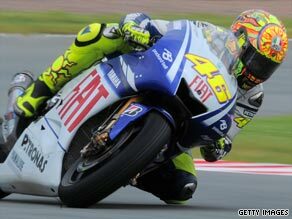 (CNN) -- Valentino Rossi won a thrilling battle with Fiat Yamaha team-mate Jorge Lorenzo to win the German round of the MotoGP world championship at Sachsenring. Rossi's 101st career victory moves him 14 points clear in the MotoGP world title standings. The defending world champion won by just half a bike length over to extend his advantage to 14 points as he made it 101 career grand prix wins. Rossi has been under pressure from his younger team-mate in recent races as the Spaniard looks to add to his value during contract negotiations. Lorenzo has been made an offer to stay with Yamaha but with Honda waiting to tempt him away his fine performances against Rossi will have seen his value go up. The race had been led in the early stages by both Rossi and Ducati Marlboro rider Casey Stoner but the closing stages were left to the two Yamaha riders to battle it out. Stoner even had to give up his hopes of finishing third as the Australian's Ducati suffered tire problems and Dani Pedrosa took the final podium spot for Repsol Honda. Rossi led from pole position on an eventful first lap which saw Randy de Puniet crash out of third position following a fine start. Stoner had worked his way past Pedrosa before taking over the lead from Rossi on lap six as the four main riders in the championship pulled clear of the field. The Australian, who had been suffering recently with anaemia and gastritis, seemed a rider rejuvenated but it soon became clear he was holding up the Yamaha duo -- allowing Pedrosa to keep in touch. Rossi and Lorenzo both got past Stoner and that left the team-mates with a third of the 30 laps remaining to battle it out. With five laps to go Lorenzo took over the lead into turn one but Rossi managed to return the compliment with two laps remaining. Lorenzo tried his best to claim a last lap pass but could not get close enough as Rossi held on to win. Pedrosa crossed the finish line in third with Stoner a distant fourth.